My favourite view in Banstead is from the top of Park Downs looking south over Banstead Woods, with a valley in between you get a wonderful view of the trees clothing the opposite side of the valley. The photo behind the title of this blog is of part of that view, taken in late autumn. This afternoon, the sun was shining across the trees and I couldn't resist. The green shoots of spring at least on the trees are just beginning to unfurl and the colours (greens!!) are quite spectacular. 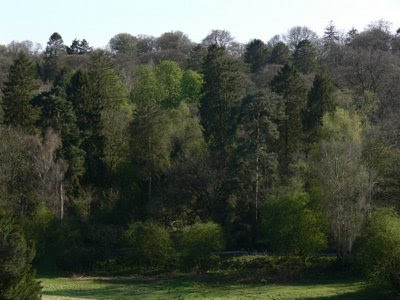 The picture above is roughly the same view as the title, looking towards the north-western end of the woods. This was once home to a large country house pulled down early in the 20th century and the woodland surrounding the house was planted with a large number of non-native species especially conifers and these provide the darker greens. The picture below was taken looking toward the north-eastern end of the Woods where there are fewer planted species. 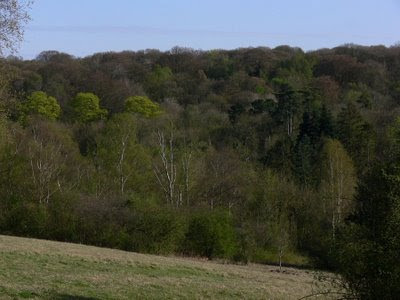 In the foreground birch and Hawthorn on Park Downs are just beginning to show leaf. The three bright green trees to the left centre of the picture are I think Sycamore in flower (I couldn't be bothered to check). The other main species in the wood, Oak and Beech are yet to show green. I will return to this view and the Woods through the spring.